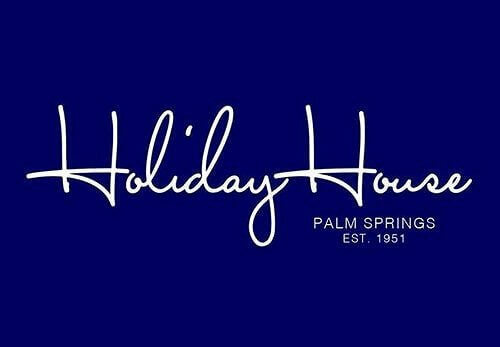 Holiday House is a 28-room boutique hotel located in downtown Palm Springs. Originally opened in 1951, the hotel was designed by noted architect Herbert W. Burns. Today, it has been reimagined by interior designer Mark D. Sikes and the team behind Sparrows Lodge. The property features mid-century inspired elements combined with a communal atmosphere and whimsical edge. The design centers around Gio Ponti inspired tile-work in the bar and artwork throughout the property including pieces by David Hockney, Roy Liechtenstein, Herb Ritts, Alex Katz and Mr. Brainwash, with a garden sculpture by Donald Sultan.